An ode to a summer love. To a food that is good for you and so, so tasty. Versatile and packed with protein and vitamins…zucchini, how I love thee! If anyone has other recipes for this fabulous vegetable, please share!! This is my ABSOLUTE favorite…it’s actually “soups” delicious (see what I did there?!). 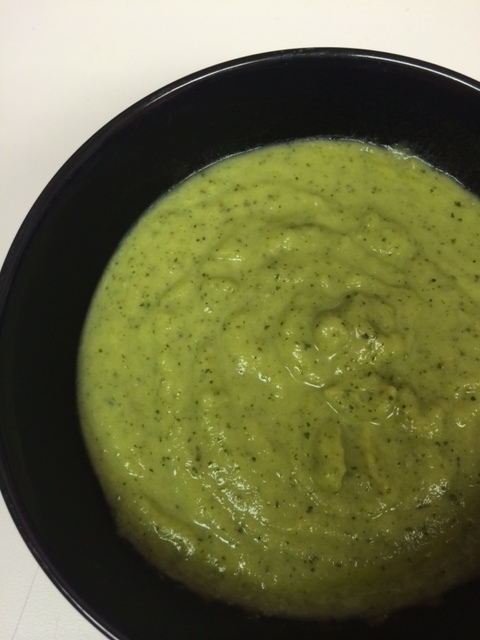 Anyway – every time I finish a bowl I’m kind of baffled that I just ate a whole zucchini (or two) in liquid form. Wow! Such veggie! So health! 1. Cut up the zucchini, onion, and garlic. 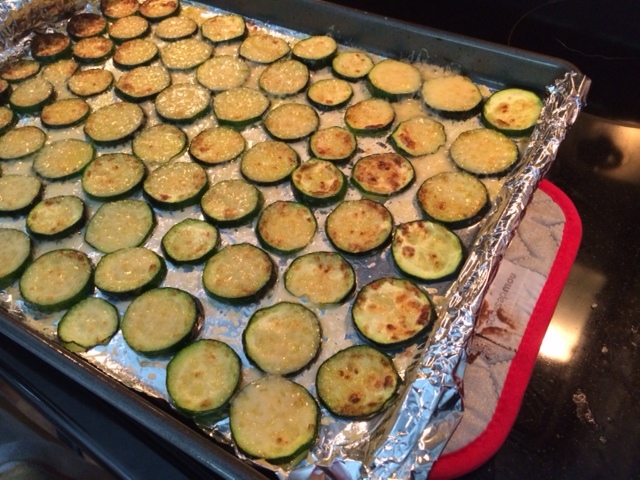 Steam them for 15 minutes* – or until the zucchini is easily pierced with a fork and the onion is turning translucent. 2. Dump your steamed veggies in a blender and add the water and olive oil. Purify that ish. 3. Add salt and pepper to taste (it’s good without it – but amazing when you add salt, IMHO). *To steam, I put an inch of water in a large pot, put in my steamer basket with the veggies, put on a lid and bring the water to a boil. Then I turn it down just a bit, but keep it boiling for all 15 mins. These are a summertime, dinner on the deck favorite in my house. And my two year old will eat them, anytime I can get something green in her it’s good – even if they are covered with cheese. 2. Lay your zucchini slices in a single layer. Brush the zucchini with olive oil. Lightly sprinkle on salt and pepper. 3. Broil for 5 minutes. Take out of the oven and cover with parmesan. Nice and easy – a staple on our grill all summer long. 1. Cut the zucchini in half the long way, and then each half the long way again – so you have four spears. 2. Spread butter on each of the spears, sprinkle on salt and pepper. 3. Put the zucchini back together as best you can and wrap tight in tin foil (one piece of tin foil per zucchini). Wrap it the long way and then fold up the ends so the butter doesn’t seep out. Onto the grill! 4. Grill on high (my hubs says 500 degrees), turning every 3 minutes or so for 10-15 minutes, or until they start to get squishy. You’ll be able to hear the butter sizzle.